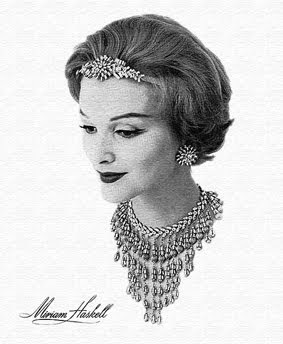 Miriam Haskell, seen below, was a celebrated American jewellery designer and business woman. She was noted for her original but affordable hand-made costume jewellery, which successfully reflected, and was sensitive to, both the economic times and historic events in America, be it the Great Depression of the 1930s or the war years of the late 1940s. Coming to the fore in America at a time when Coco Chanel had just launched her vrais bijoux en toc, or real fake jewelry, collection in Europe, Miriam was able to ride on an American obesssion with French fashion and model her early jewellery on European costume jewellery, competing directly with Chanel and Italian designer Elsa Schiaparelli. 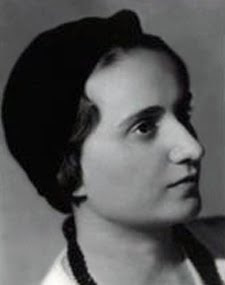 One of four children, she was born in the small town of Tell City, Indiana, to her Russian Jewish immigrant parents. They owned one of the town’s dry goods stores carrying fabric and cloth, somewhat akin to an English haberdashery store. Miriam progressed through High School in nearby New Albany before studying at Chicago University for three years, but without graduating. In 1924 Miriam set off for New York City with a fabled $500 in her purse, more than likely loaned to her by her shop keeper father. 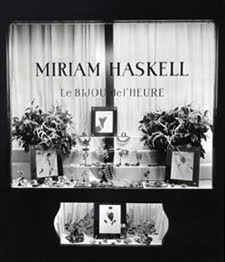 On the 30th July 1926 a business permit was issued in Miriam’s name, allowing her to open a gift shop style boutique –Le Bijou de L’Heure – in The McAlpin Hotel on 103 Sixteenth Street. During the Great Depression, which in America hit in 1929 and lasted a decade, Miriam Haskell’s costume jewellery provided affordable pieces which matched the glamour of the time, but used cheaper art glass, strass (paste) or rhinestones, and gold plate parures to achieve the look. When the economy merited it Miriam used more expensive natural gemstones alongside handmade beads from Czechoslovakia, France, Germany, Italy, and Russia, whilst incorporating unusual metal findings and stamps in the designs. 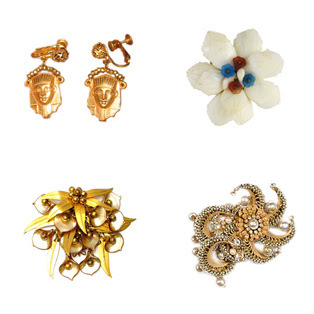 Whilst many of her signature pieces were known for their use of faux baroque pearls, Russian gold filigree metal work, and the inclusion of nature in the form of berries, leaves and intricately detailed flowers. She would often travel with Frank Hess to Europe on buying trips to Paris, Gablonz, Venice, and Wattens in Austria, which was the location of the Swarovski crystal factory. 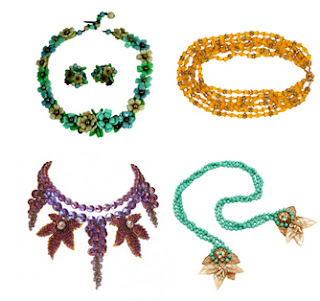 With European bead supplies curtailed during the Second World War, she in turn contributed to the war effort, asking Frank Hess to create patriotic new metal free jewellery designs, using natural materials and plastics, with the required beads and crystals purchased closer to home. After the war, Haskell renewed her use of high end materials, including pearls from Japan, and her designs became ever more colourful and vibrant. 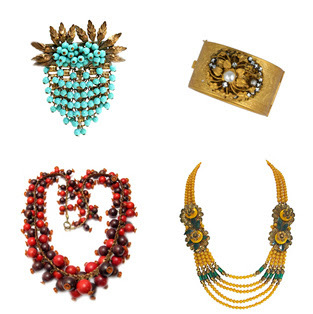 They also became more elaborate including larger focal pieces, and necklaces with multiple bead strands. In 1950, Miriam was forced to sell the company to her brother Joseph Haskell, due to poor health. It is said that the horrors of the Second World War began to affect her health and emotional stability, and the opportunity was taken to rest control of the company from her. Living in an apartment on Central Park South with her widowed mother through the next two decades, her erratic behaviour intensified and she displayed symptoms of depression and obsessive compulsive disorder. In 1977, she moved to Cincinnati, under the care of her nephew Malcolm Dubin, where she later died at the age of 82, on the 14th July, 1981. Today Miriam Haskell jewellery, particularly that from the golden period of the 1940s and 50s, is much sought after by collectors of vintage costume jewellery and can command high prices, though it is still possible to find reasonably priced pieces on auction sites, as well as left over stock of beading materials and findings which didn’t find their way into her end pieces. It is worth noting that her jewellery was very seldom signed before she lost control of her company in 1950, so confirming a piece as Miriam Haskell requires a degree of research. (A good reference book for this task is Miriam Haskell Jewelry co-wriiten by Cathy Gordon and Shelia Pamfiloff alongside the well catalogued advertisements produced to promote each new range). It was her brother, Joseph Haskell, who upon taking over the company introduced a Miriam Haskell signature, perhaps to strengthen the association between the jewellery, his sister, and their customers now that she was no longer at the helm of the company. That said, for very short period in the late 1940s, a New England jewellery shop did enforce a signature on her jewellery in the form of a horseshoe shaped plaque embossed with Miriam Haskell. These pieces probably constituted less than one percent of early jewellery production and as such a piece with this signature would now be a rare find. This interest in Miriam Haskell jewellery also extends to collecting contemporary advertising watercolours produced by Larry Austin to promote her jewellery. 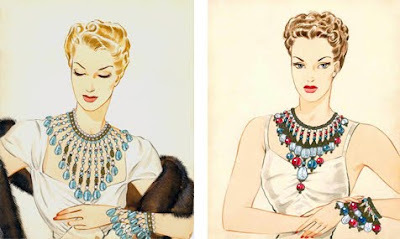 These typically featured sophisticated looking models wearing the fashions of the day whilst sporting larger than life examples of Miriam Haskell bracelets, necklaces, and pins as seen below. We see this blog as a natural extension of our online bead shop Big Bead Little Bead and the online tools that it offers beaders in the form of a Bead Tray, Bead Calculator plus a wealth of Guides and Information. This is a location from which we can share with beaders all the advice, history, people, stories and techniques that we have discovered as we navigate the world of beads and jewellery making. Copyright © 2008-2012 Big Bead Little Bead. Picture Window theme. Powered by Blogger.